The runoff of three residual herbicides was higher than for the knockdown herbicides. 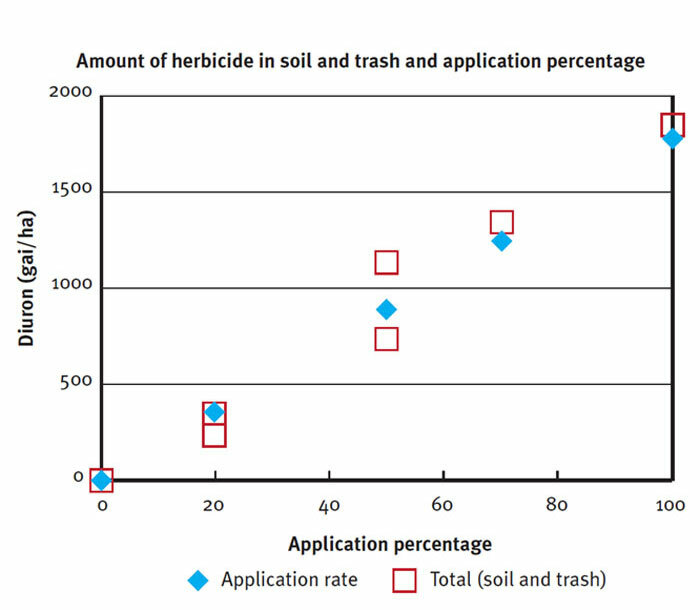 Residual herbicides also persist longer in the environment. Reducing the amount of herbicide applied will reduce the losses in runoff. Weeds are a major contributing factor to losses in both production and profits for the sugarcane industry. Minimum tillage and green cane trash blanketing is considered best practice management in cane. Herbicides are used to control weeds; however, there are concerns about chemicals including herbicides being transported to the Great Barrier Reef. The photosystem inhibiting (PSII) residual herbicides are of greatest concern due to their potential to affect algae, seagrasses and coral. 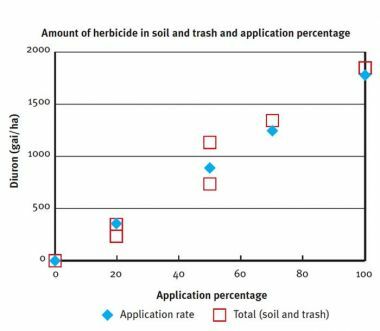 Reducing the use of PSII residual herbicides, such as atrazine, diuron, hexazinone and ametryn, and using alternatives such as knockdown herbicides as part of an integrated weed management strategy, is considered best practice (Rolfe et al. 2007). Band spray application is also suggested as an improved practice. This project in the Mackay region measured the amount of herbicides moved in runoff from a standard rain storm applied with a rainfall simulator. This study was undertaken on a sugarcane field with recently emerged ratoon cane. The site had a sandy soil (Sodosol), low slope and almost 100 per cent groundcover of trash and weeds. knockdown herbicides – glyphosate and 2,4-D amine. Rainfall was applied at 80 millimetres per hour for 40 minutes, one to two days after herbicide application. Two to four plots of each treatment had rainfall applied using a rainfall simulator. Runoff rate and sediment concentration (almost nil) were measured through time. Runoff was sampled seven to 14 times for chemical analysis. Soil and trash samples were taken before the rain and analysed for the chemicals. Residual herbicides (diuron, hexazinone, metolachlor) runoff more than the knockdown herbicides glyphosate and 2,4-D due to their inherent properties. Over time, these differences will become even greater because the knockdowns decay more rapidly than the residuals. 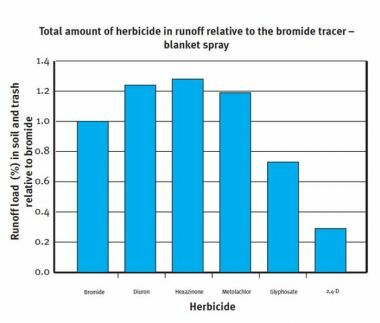 Glyphosate and 2,4-D load in runoff was 40 per cent and 76 per cent less than the residuals for blanket spray respectively. 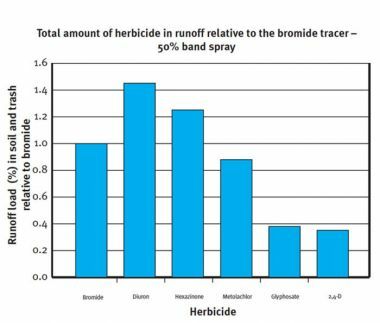 Glyphosate and 2,4-D load in runoff was 68 per cent and 71 per cent less than the residuals for band spray respectively. These knockdown products have lower toxicity in receiving waters than the residual herbicides (ANZECC/ARMCANZ 2000). Reducing the amount of herbicide applied (e.g. by band spraying) will reduce the losses in runoff. This finding is supported by several other studies in Queensland (Masters et al. 2012 Silburn et al. 2012). Band spraying reduced the losses in runoff for all herbicides by half. Avoid spraying when rainfall is forecast. Spray earlier before the wet season or when risk of rainfall is lower (see First 20 days after herbicide application is the high risk period for runoff in the Mackay Whitsunday region case study). Use precision spraying technology such as band spraying (see Precision application (band-spray) of herbicides on sugarcane in the Burdekin region case study). Retain cane trash (see Comparing runoff loss of knockdown and residual herbicides in the Herbert catchment and Sub-surface fertiliser application reduces nutrient runoff in the Herbert catchment case studies). Mark Silburn and Samuel Rojas-Ponce (Queensland Government Department of Natural Resources and Mines); Emilie Fillols (BSES Limited, Mackay); Jack McHugh and Craig Baillie (National Centre for Engineering in Agriculture, University of Southern Queensland, Toowoomba). ANZECC and ARMCANZ (2000). Australian and New Zealand guidelines for fresh and marine water quality. Volume 1 – the guidelines. National water quality management strategy paper No 4. Australian and New Zealand Environment and Conservation Council and Agriculture and Resource Management Council of Australia and New Zealand, Canberra, Australia. Masters B, Rohde K, Gurner N, Reid D (2012). Reducing the risk of herbicide runoff in sugarcane through controlled traffic and early-banded application. Agriculture, Ecosystems and Environment. Silburn DM, Foley JL, deVoil RC (2011). Managing runoff of herbicides under rainfall and furrow irrigation with wheel traffic and banded spraying. Agriculture, Ecosystems and Environment.